Keep Calm and Zendoodle™ On! Keep Calm and Zendoodle™ On! Create your own peaceful patterns on heavy cardstock squares printed with a bold black velvet flocked border and block pattern. 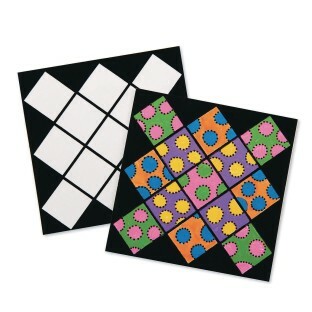 Unique pattern is reminiscent of a classic “granny square” quilt or modern tessellation design. Works well with an array of drawing supplies. Doodling is a relaxing pastime that helps with focus. Perfect for individual or community group craft projects all ages will love.